Tso Pema Orgyen Heruka Nyingmapa Gompa aka Tso Pema Nyingmapa Gompa is a retreat center founded by Dudjom Rinpoche on the banks of Tso Pema lake, a sacred site of Guru Rinpoche in the northern state of Rewalsar, in India. 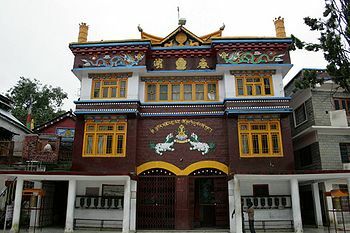 Tso Pema Nyingmapa Gompa is the oldest of Tso Pema’s monasteries, where there is also a large Drikung Kagyü monastery, and is dedicated to the Dudjom Tersar lineage. In the 1960s, Chagdud Tulku Rinpoche and Wangdor Rinpoche were in Tso Pema together. It is said that Wangdor Rinpoche meditated in the caves of Tso Pema for 30 years. In solitary retreat during the early years, he was joined over time by more than fifty cave-dwelling yogins and yoginis who look to him for guidance and support. Wangdor Rinpoche helped Dudjom Rinpoche build the monastery, and later created a retreat center on the mountain. Guru Rinpoche statue, facing the Tso Pema lake. 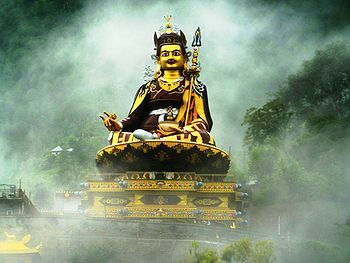 Recently, Wangdor Rinpoche has built a monumental statue of Guru Rinpoche which is standing directly above the lake. This page was last edited on 25 July 2014, at 18:13.